Under the Oaks is a ceremony hosted each year by the Newcomb College Institute during Commencement week. 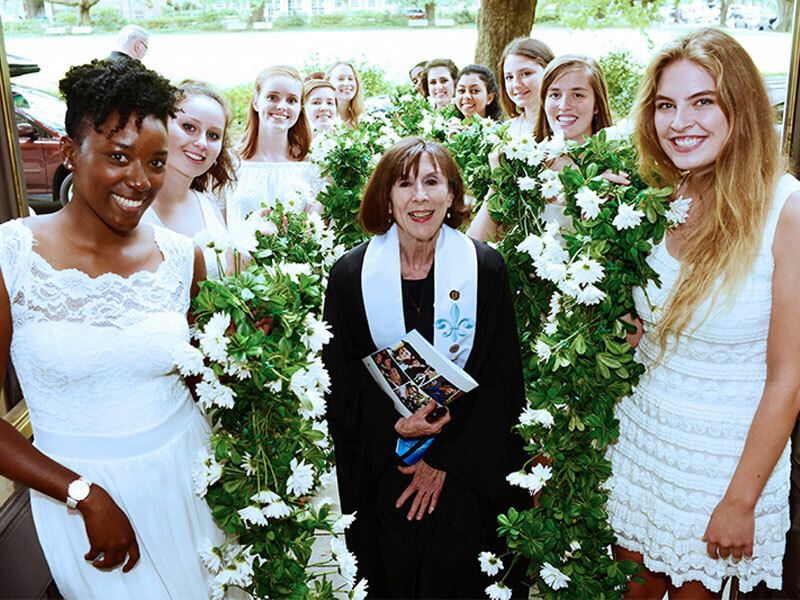 At Under the Oaks, we honor graduating students, including award recipients (named awards and Oak Wreath), Newcomb Scholars, Mortar Board members, Newcomb grant recipients, Center for Public Service award recipients, Newcomb Alumnae Association award recipients, outstanding faculty, and the Newcomb College Class of 1969. Many cherished traditions from the Newcomb College commencement ceremonies are celebrated at Under the Oaks, including the Daisy Chain, presentation of a second diploma to each member of the Newcomb College Fifty Year Class, wearing of the brown robes, distribution of class pins and mortar board decals, and singing of the Newcomb College Alma Mater. When is “Under the Oaks”? Under the Oaks will be held Friday, May 17, at 2 pm in Dixon Hall with a reception to follow in Dixon Hall. Who can attend Under the Oaks? All women graduating from Newcomb-Tulane College (Schools of Architecture, Business, Liberal Arts, Public Health, Science and Engineering) in May 2019, December 2018, or August 2018 and their families/guests are invited. Faculty who are Newcomb Fellows and members of the Newcomb Alumnae Association are invited, as are families of the NAA award recipients. Tickets are not required, so anyone can attend. Should I or my parents/guardian RSVP? No need to RSVP! For questions, email newcomb@tulane.edu. Will I receive my diploma at Under the Oaks? No. With the exception of Doctor of Medicine students, all graduates will receive their diplomas via FedEx delivery three to four weeks after commencement on May 20. Please visit http://tulane.edu/grads/index.cfm for information on the unified ceremony and the various diploma ceremonies. Should I wear my regalia (graduation robe and cap) to Under the Oaks? Members of the Class of 2019 who are Newcomb Scholars, Newcomb award recipients, Newcomb grant recipients, or members of Oak Wreath are asked to wear regalia. All others may wear regalia if they wish. Who will walk across the stage at Under the Oaks? Newcomb Scholars, Newcomb award recipients, Newcomb grant recipients, and members of Oak Wreath will walk across the stage individually. Mortar Board members will not wear regalia and will be recognized as a group from where they are seated. Other members of the Class of 2019 can be seated with their guests and will not walk across the stage. When should my guests and I arrive at Dixon Hall? Doors will open at 1:15 and the ceremony will begin at 2:00. Seats will be reserved for award recipients, grant recipients, and Oak Wreath members. Tell any usher which group you are with, and she will direct you. Please note: We will close the doors at 1:55 to allow our processional to assemble and enter at 2:00. Once the processional has entered, we will re-open the doors for late-comers IF seats are still available. How will I know if I am an award recipient? What do I need to do? You will be notified by email (to your Tulane email account) and you MUST rsvp as directed so that you will be called to the stage to receive your award. Newcomb Scholars, Newcomb Award recipients, Oak Wreath members, Newcomb grant recipients, and Mortar Board members all will be recognized at Under the Oaks, right? Newcomb Scholars will wear regalia and be seated as a group. Scholars will be escorted to the stage steps as a group and will walk onto the stage individually (alphabetically) as each name is called while a slide listing your accomplishments is displayed. Each will receive a Newcomb Scholars stole and then step aside but remain on the stage until the entire group has received stoles. Scholars will then be congratulated as a group then exit the stage and return to their seats. Newcomb Award recipients will wear regalia and will be seated as a group. Any usher can direct you to your seating section. Award recipients will be escorted to the stage steps as a group by a Newcomb staff member. Check the program for which award you are receiving and be ready to walk onto the stage when your name is called. You will shake hands with NCI Executive Director Sally Kenney, you will receive a certificate, exit the other side of the stage and return to your seat. Oak Wreath members will wear regalia and will be seated as a group. Any usher can direct you to your seating section. You will be escorted to the stage as a group by a Newcomb staff member. You will walk across the stage as your name is called alphabetically and while a slide listing your name and your accomplishments is displayed. You will shake hands with NCI Executive Director Sally Kenney, exit the other side of the stage and return to your seat. You will have already received your certificate at the Oak Wreath dinner. Grant recipients will wear regalia and will be seated as a group. Any usher can direct you to your seating section. You will be escorted to the stage as a group by a Newcomb staff member. You will walk across the stage individually as your name is called alphabetically and while a slide describing your funded project is displayed. You will shake hands with NCI Executive Director Sally Kenney, exit the other side of the stage and return to your seat. Grant recipients do not receive certificates. Mortar Board members who are not also members of any of the above groups do not have to wear regalia and can be seated with their families/guests. Mortar Board members will be listed in the program and will be asked to stand and be recognized as a group following the presentation of the teaching awards by the Mortar Board president. Center for Public Service award recipients who are not also members of any of the above groups do not have to wear regalia and can be seated with their families/guests. CPS award recipients will be listed in the program. I am a member of more than one of the groups that will be recognized individually. With which group will I be recognized and seated? Each Newcomb Award Recipient will walk across the stage to receive her certificate. Each Newcomb Scholar will walk across the stage to receive her stole. Each Oak Wreath member who is not a Scholar or not receiving an award will walk across the stage as an Oak Wreath member. Each grant recipient who is not a Scholar, not receiving an award, and not a member of Oak Wreath will walk across the stage as a grant recipient. When your name is called and you walk onto the stage, you don’t need to hurry! The steps are steep. A photographer will be at the “down” steps, and sometimes there’s a logjam! This is your moment, take your time! Is there wheelchair access to Dixon Hall? Yes, there is a wheelchair ramp at the front entrance to Dixon Hall, but wheelchairs are not available for rental. Ushers can direct guests in wheelchairs to a reserved seating area. Where can I get a class pin and decal for my mortar board? Can I wear those at the Tulane unified commencement ceremonies? Class pins and Newcomb mortar board decals (the blue N) will be available following Under the Oaks at the reception at the Lavin-Bernick Center. You should wear both at the Tulane commencement ceremony. Will I be able to attend the Newcomb-Tulane award ceremony in McAlister? Yes. Our reception will end by their 4:30 start time. The Daisy Chain has been a tradition in Newcomb College commencement ceremonies since the early days of Newcomb College. It consists of over 1,000 daisies assembled by members of the junior class. Earlier chains were made from clover, oleander, magnolia or daisies and were collected from campus gardens and neighbors’ yards. Although daisy chains were once a frequent sight on women’s college campuses, Newcomb has one of the few remaining chains in the country. The Newcomb College Institute is proud to continue this important tradition of Newcomb College at our Under the Oaks Ceremony.